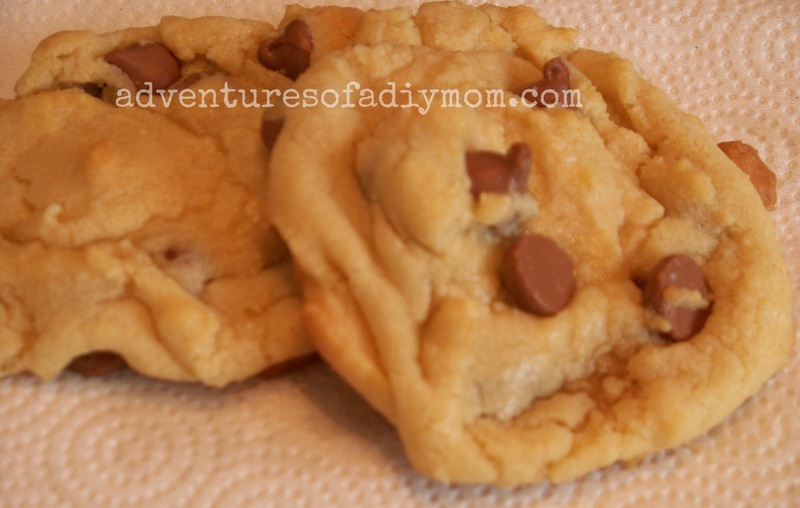 I've tried lots of different chocolate chip cookie recipes. But I always come back to this one. It was my Grandma's. Cream shortening and sugars. I always use a wooden spoon instead of beaters. They just seem to turn out better. I always use butter flavored Crisco. A tip I learned about measuring shortening. Crack your eggs into your measuring cup. Swirl it around until egg has covered it. Then dump the eggs into a small bowl. When you fill it with shortening, it will slide right out and it's way easier to clean. Next add your eggs and vanilla. Sift in flour, baking soda and salt. Then add chocolate chips. Drop rounded teaspoonfuls onto a greased cookie sheet. Bake at 375 for 8-10 minutes. Make sure they are very slightly browned on the edges and they should seem a little gooey. Cream together shortening and sugars. Add eggs and vanilla and stir. Sift in flour, baking soda and salt. Add chocolate chips and nuts if desired. Drop by teaspoonfuls onto greased pan. Bake at 375 for 8-10 minutes. Let cool on pan for 2 minutes before placing on wire rack to cool completely. My mom always adds the walnuts, very finely chopped (almost like a flour) and it's very good that way. I'm just to lazy to chop nuts. You would need to only add 2 1/4 c. flour if you did that. If you find that your cookies spread out a lot and are flat, you need to add more flour. I generally use 2 3/4 c. flour. You can always just bake one cookie first to find out. These are to die for right out of the oven, but I love them cooled or slightly warmed in the microwave too. Make sure you grab a few before your family eats them all!